Independent Directions to this Site: From Autoroute de la Gatineau or Highway 5, take exit # 3 or Boulevard St-Raymond heading west. Travel 1.5 km west to Promenade du Lac-des-Fées and turn left or south on it. Follow Lac-des-Fées 0.4 km to Rue Gamelin and turn right or west on it. Go 0.9 km to the (Promenade de la) Gatineau Parkway and turn right or north on it. Proceed 7.5 km northwest, to the junction of the (Promenade de la) Gatineau Parkway with the (Promenade) Champlain Parkway. Turn left or WSW onto the (Promenade) Champlain Parkway and drive 9.3 km to the entrance, on the right or northeast, to the Étienne-Brûlé Lookout and picnic area. Gatineau Park South Route Directions: From the Huron Lookout parking lot, return to the (Promenade) Champlain Parkway, turn left or northwest and drive 0.2 km to the entrance, on the right or northeast, to the Étienne-Brûlé Lookout and picnic area. 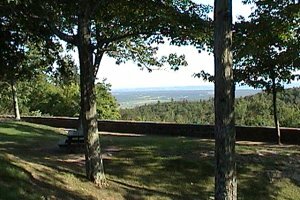 Site Description and Birding Information: The Étienne-Brûlé Lookout is a popular picnic spot in the summer months. It provides access to the wonderful trail system, a view out over the escarpment and an area of mature trees cleared beneath from the picnic tables which is great for flycatchers and warblers. In winter, this section of the parkway is closed to vehicles and is opened to skiing only. Hikers may still use the trails. The exact dates are weather dependent, but usually from mid-November to early April. Singing Cerulean Warblers have been found 20 to 30 metres behind the Étienne-Brûlé Lookout sign along the (Promenade) Champlain Parkway. They sang as if on territory in both May 2004 and June 2005. Gatineau Park South Route Directions: From the Étienne-Brûlé Lookout parking lot, return to the (Promenade) Champlain Parkway, turn right or northwest and drive 0.7 km to the entrance to the parking areas for the Champlain Lookout, the next site on this route. Return to Gatineau Park South. Return to Birding Ottawa Table of Contents.